To keep their eyes on this prize, Christians are compelled to distance themselves from so much in the New Testament. In a careful reading of the gospels they can (should!) be taken aback by chilling teaching attributed to Jesus, but they evade and rationalize these texts to shield the faith. And the apostle Paul’s own words—something we don’t have from Jesus—should cause just as much anguish. One of his letters is probably the oldest Christian document in the New Testament, and it shatters any confidence about his grasp of reality. 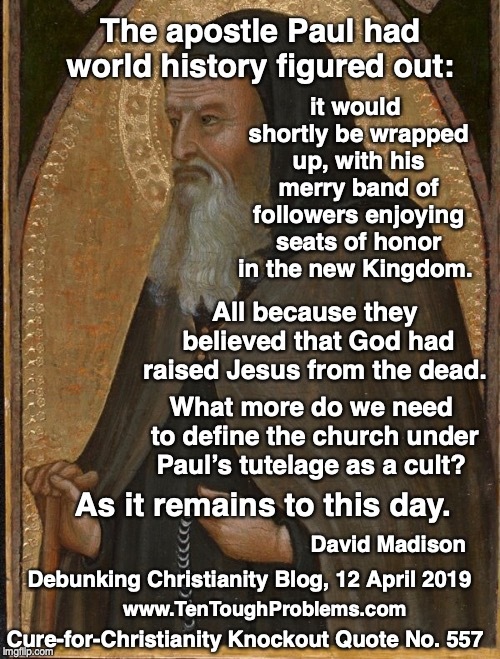 This is the final article in my series on the five chapters of Paul’s Letter to the Thessalonians, known as First Thessalonians. Here are the links to the previous articles: Chapter One, Two, Three, and Four. And, by the way, I have launched my series of Flash Podcasts on Things We Wish Jesus Hadn’t Said. Here is Episode 1. In chapter four we encounter Paul’s comic book fantasy about the arrival of Jesus in the clouds to bring his kingdom to earth. Even dead Christians will rise from their graves to meet their superhero “in the air,” along with everyone else who had so eagerly awaited the moment. And how will all those outside the cult “feel the love for all humanity” that my Christian friend was so sure of? “When they say, ‘There is peace and security,’ then sudden destruction will come upon them, as labor pains come upon a pregnant woman, and there will be no escape!” (v. 3) Destruction, pain, no escape for those outside the cult. A sure thing about God that they had to escape was his wrath, which required special breastplate and helmet to withstand! Christians commonly fail to see this in its context; Paul was urging good conduct within the community of believers. But when he looked at the world around him, he vented his rage and gloated at the prospect of God himself repaying evil for evil. Thus Christians who delight at the prospect of God getting even with sinners aren’t bothered by Paul’s ranting in Romans 1: “For the wrath of God is revealed from heaven against all ungodliness and wickedness…” (v. 18). His list of those “who deserve to die” at the end of Romans 1 includes gossips and rebellious children. 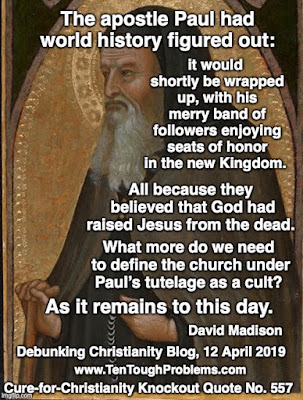 What more do we need to define the church under Paul’s tutelage as a cult? As it remains to this day. Although there are thousands of Christian brands, most of them seem to be aligned on the importance of Christ dying for their sins (how is a human sacrifice not a clear marker of cult strangeness? ), the importance of believing this—and, of course, the ultimate cult strangeness: pretending to eat the body of their God. We are assured of its sublime holiness, but the ghastliness of it all somehow escapes notice by those who are taught from the cradle that it’s all okay. Even the apostle Paul might have been disappointed. He had no use whatever for venerating dead bodies, presumably even body parts. All those dead who would rise to meet Jesus in the air would have spiritual bodies. (1 Corinthians 15:44) But above all, he would have been disappointed that history hadn’t come to a dead stop as he promised; that an era known as the 18th century—with a French Revolution—would come to pass; that the church would go on to build countless grand cathedrals to honor their dead Lord who never showed up. Somehow Paul failed to pick up on all these details in his visions of the Risen Christ. David Madison was a pastor in the Methodist Church for nine years, and has a PhD in Biblical Studies from Boston University. This book, Ten Tough Problems in Christian Thought and Belief: a Minister-Turned-Atheist Shows Why You Should Ditch the Faith, was reissued last year by Tellectual Press with a new Foreword by John Loftus.